Bags of food are distributed Monday, Wednesday, and Friday from 8:30 a.m. to 4:00 p.m. 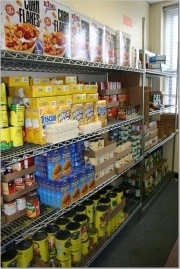 Individuals and families can utilize the pantry on a monthly basis. At the present time, the following items are needed for our Food Pantry. Once the new client intake has been completed, clients do not need to make appointments when accessing the pantry in the future.